"Awesome smoky noodle bowl. You will be drinking the broth when the noodles are all gone." Combine chicken broth, coconut milk, corn, soy sauce, chile oil, paprika, sriracha hot sauce, honey, garlic, chicken bouillon, red pepper flakes, cracked black pepper, and seasoned salt in a pot; bring to a boil. Add noodles and cook until heated through, 1 to 2 minutes. Add shrimp and cook until cooked through, 3 to 5 minutes. Serve in a big ramen bowl. Watch Chef John make a simple, soothing chicken noodle soup. If you use low-sodium chicken broth and soy sauce, you may need to add a 1/2 teaspoon salt. Substitute veal broth for chicken broth, chicken for shrimp, canned corn for fresh corn, ramen noodles for udon noodles, and/or 1 tablespoon garlic powder for fresh garlic, if desired. I doubled the recipe but kept the original amount of spicy ingredients plus added spinach and used frozen corn. It was fantastic. Both my teenagers loved it. TO DIE FOR!!! We love spicy food, and it's spicy!! But it's so good. I added some leftover crab, spinach instead corn. Thank you Chef T.! This was wonderful. I made it exactly as stated. There was quite a bit of liquid in proportion to the noodles. 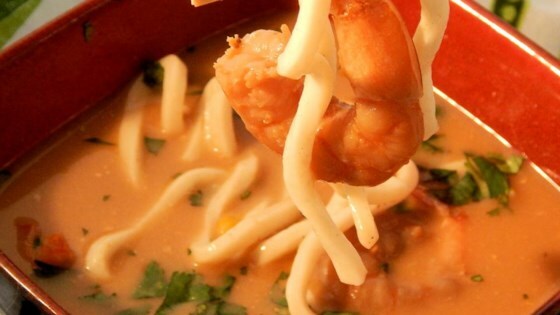 I highly recommend doubling the noodles and shrimp. Very spicy. We love that! Very spicy but really good!